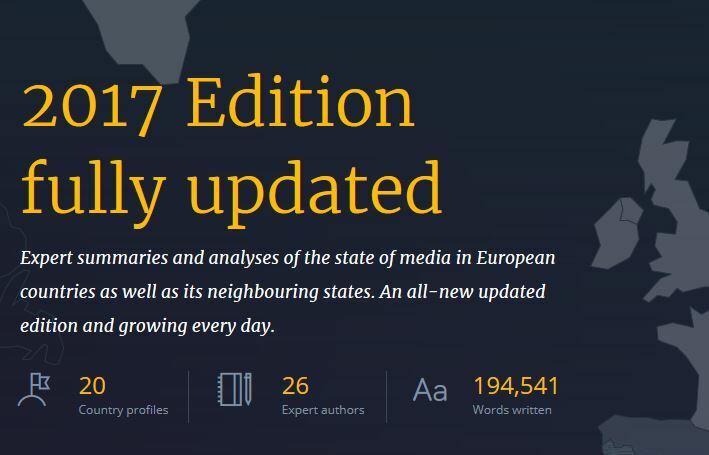 The European Journalism Centre has recently published the 2017 Edition of its Media Landscapes tool, an online resource mapping the state of the media in 20 countries. It features 20 expanded reports and additional facts, a legal section as well as a short summary for a quick overview. The project is funded by the Dutch Ministry of Education, Culture and Science. The Media Landscapes tool involves twenty-six expert writers who have mapped the entire journalism ecosystem of twenty countries. It provides a very valuable resource for students, researchers, social and political commentators and journalists. Each country features details on the historical evolution of its media scene and the major players, then and now. Print, broadcast and digital outlets are covered, as are all relevant associations, professional bodies, unions and educational institutions. Each report then replaces this in its socio-political context of regulation, legislation and press freedom.